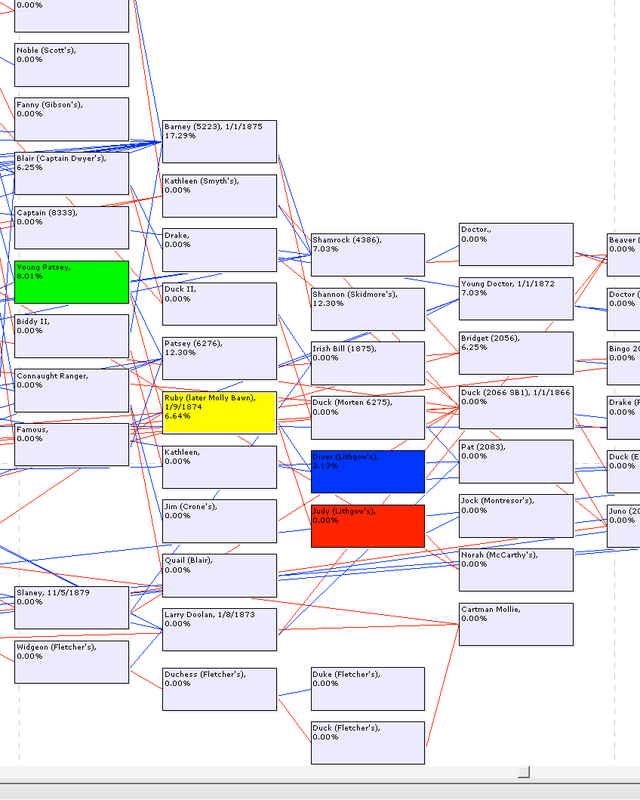 This is a "quickie" look at an unedited database in which there are many obvious instances of missing information and known errors. Missing information about parents can profoundly affect the coefficient of inbreeding - making it an UNDERESTIMATE of the true value. In this database of about 15,000 animals, there are over 1,000 instances of missing parents. So keep that in mind. 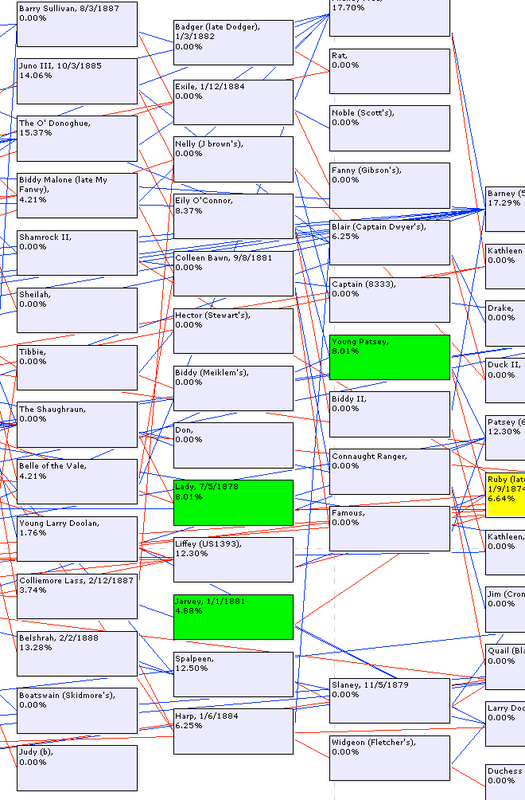 I have computed inbreeding coefficients using all the data back to founders (which go back to the 1860's plus McCarthy's Boatswain in 1834). I've drawn 3 horizontal lines on this graph. The COI of 6.25% is the level of inbreeding equal to a mating of first cousins; 12.5% is half-sibe; 25% is full sibs. You can see that all dogs produced since about 1975 have had a level of inbreeding greater than full cousins, and in fact the vast majority have been more inbred than half-sibs. Since about 1990, there has been a significant number of dogs with inbreeding greater than 25%, and it looks like in the last few years we've had no dogs less than about 15%. 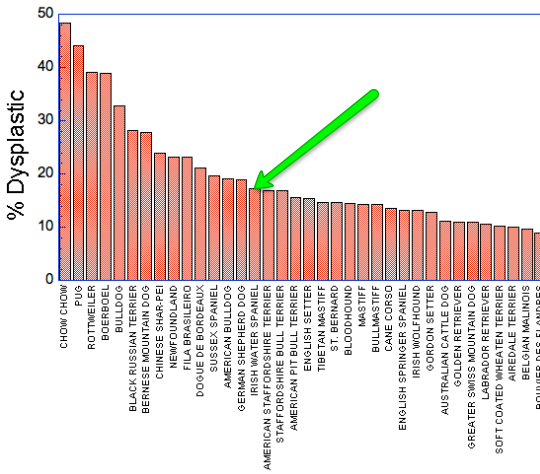 There are plenty of dogs with COI > than 30%. For perspective, DNA testing for a recessive mutation will eliminate the 25% risk of producing a pup with a genetic disorder from two carriers. But ALL breedings nevertheless have a risk of producing dogs homozygous for a recessive mutation of at least 12%. A healthy population of animals should have a level of inbreeding below 5%, and above 10% you fight a constant battle against increases in inbreeding depression and expression of genetic disorders (see this). Many breeds started with very few founders, so there will necessarily have been inbreeding early on when type was being fixed and the numbers were small. The breed is above that 10% limit now. For perspective, you should know that the average level of inbreeding in Afghans and Poodles is about 20%, which are both far larger breeds with comparable long history. 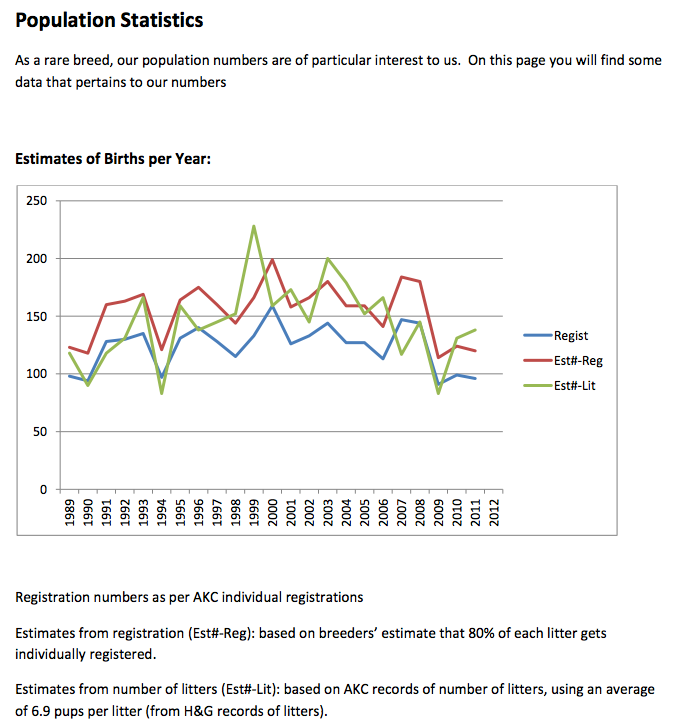 For the short term, the first thing we would want to know is whether the level of inbreeding can be reduced in the current population by pairing dogs that are less related than average. That would be using something called the "kinship coefficient", and it takes a while to run on a database with this many generations. The immediate goal of a breeding plan would be to make the best use of the existing genetic diversity in the breed and prevent inbreeding from increasing unnecessarily. Many papers are published with information about genetic disorders and health of many breeds, but they are usually presented as a table, which I find nearly useless. When I have time, plot the data so I can see who is where, and below are some of these graphs. All of them are under the appropriate category under "Heath Data" on the ICB website, and many that are too small to read here have larger versions there that you can look at. 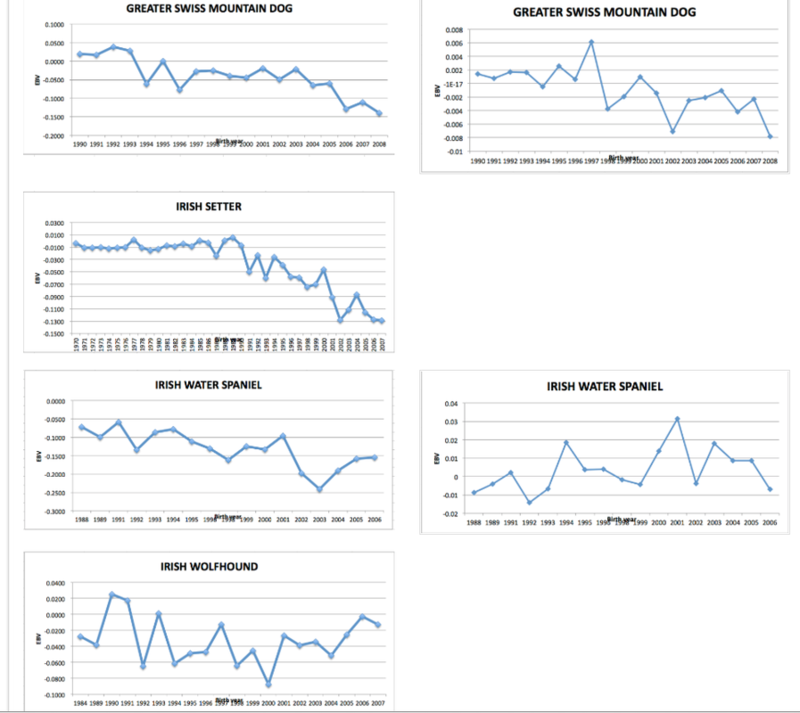 These are data for maximum (top), average (middle), and median (bottom) lifespan (or age at death) for various dog breeds. 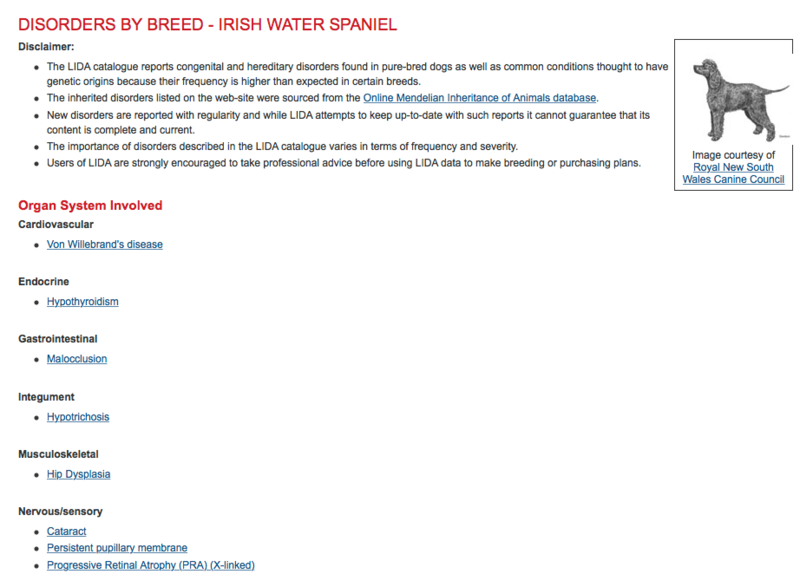 Maximum age for IWS is about in the middle of the pack, but actual lifespan appears to be much lower than other breeds. Reduced lifespan is one consequence of inbreeding depression, so that's something we can think about. For instance, Armstrong found that Standard Poodles with COI < 7% lived on average 4 years longer than Poodles with COI higher than 7%, and there are similar effects of inbreeding on lifespan in other breeds (see HERE). 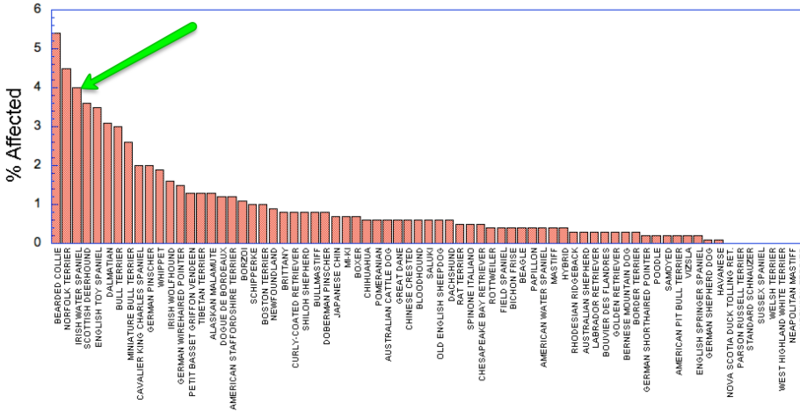 The graph below is from the OFA Cardiac database, and I was very surprised to see IWS up at the top. I don't know what the issues are (valve? muscle? ), but any breed that ranks higher than the Cavalier needs attention. This is cause of death by cancer (red), age (blue), cardiac (green) and urologic (black). Lots of dogs dying of cancer, not many of old age. You can read more about this study HERE, and you can learn about EBVs HERE and HERE. Below is the graph for Elbow Dysplasis (based on OFA).